Let's talk hair care. I've been paying extra special attention to my locks lately & ever since my small research about silicones and what these sillicones do to your hair. That's why been looking into natural oils and oil blends to take care of my locks, and I must say that it has been paying off. 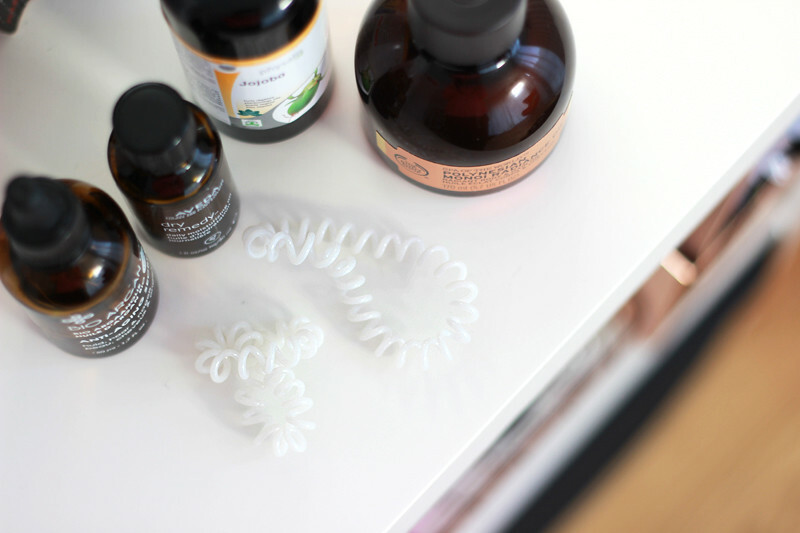 You can apply a small amount during the day to keep that moisture in your hair and control frizz or fly-aways, but my most favourite way of using them is by applying a blend of oils liberally all over my hair & letting it rest for a full night. You'll feel and see the results! I bought pure argan oil in my local health store after reading so many good things about it. This one really does wonders for your hair - you don't need to use too much, just a few drops is enough to run through your hair. Jojoba oil is another great oil to use: it's very hydrating, but also its molecular structure is very similar to sebum and therefor also great to use on your scalp. I am also a big fan of Aveda's Dry Remedy Daily Oil, a blend of oils that contains no silicones, which isn't as straight-forward as you'd think. Ever since I started paying much more attention to the ingredients stickers I have been surprised at how many "oil treatments" actually contain very little oil. Another good and very affordable option is The Body Shop's Polynesian Monoï Radiance Oil from their Miracles Of The World range. It contains coconut oil as well as a few other natural oils & smells delicious like fragrant tiare flowers. 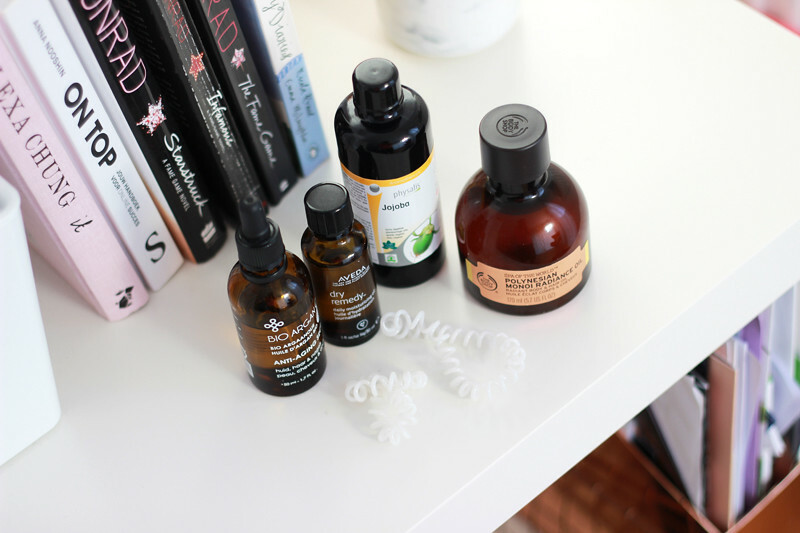 At night when I know I'll be washing my hair the morning after (I'm a morning shower type of person), I often will make a mix of all the oils mentioned here and coat my hair liberally with it. It doesn't look good - think super greasy - but it makes my locks super soft and manageable. Another tip I'd wanted to share is paying attention to the hair elastics/bands you use to tie your hair. 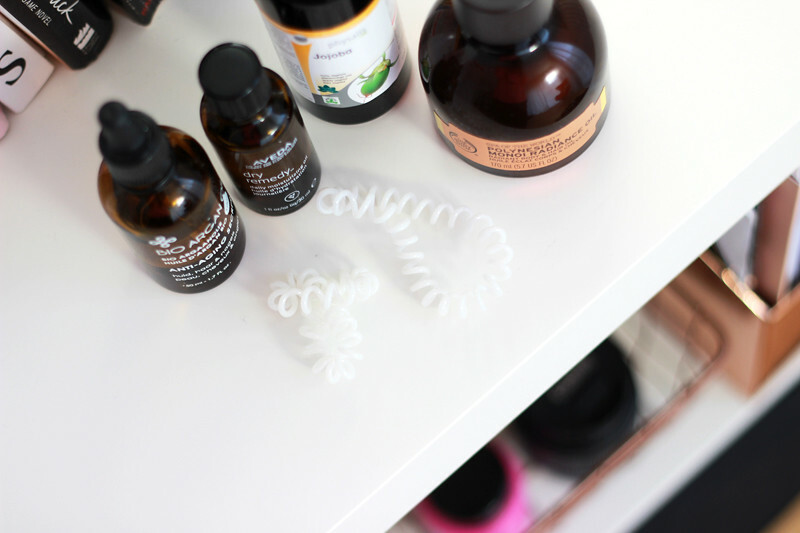 I've been using Invisibobble hair elastics for the past few months now and I have been so happy with them. At first I wasn't too sure about them as they're a little weird and it takes some getting used to, but now I actually have them on my shopping list as I want a few more. I did have housekeeping in a hotel toss one away as they probably thought it was meant to be in the trash can, so be warned!